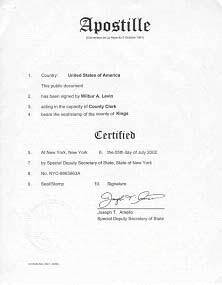 We now obtain New York Apostilles for short and long form Birth and Death Certificates without exemplification letters. As UAE and Saudi Arabia embassies in the U.S. do not accept virtual degrees for legalization - we now provide legalization of virtual diplomas and transcripts through U.S. State Department + embassies in third countries. Who can issue an apostiile in the United States? How to obtain an apostille? How long does it take to obtain an apostille by mail? How much does it cost to obtain an apostille? Is there another way to quickly obtain an apostille? Can a document be presented in a foreign language? A. 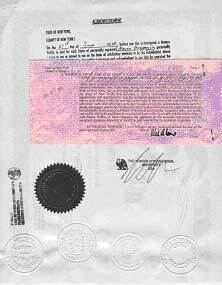 An apostille (French word meaning notation) is a standard certification provided under The Hague Conference on Private International Law: 1961 Convention Abolishing the Requirement of Legislation for Foreign Public Documents for the purpose of authenticating documents for use in foreign countries. The treaty was ratified by the United States on Sept.1, 1981. The apostille is formatted in numbered fields that allow data to be understood by the receiving country regardless of the official language of the issuing country. Q. WHAT IS AN APOSTILLE FOR? 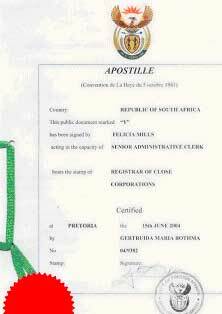 A. Apostille is a form of certification of a document (e.g. 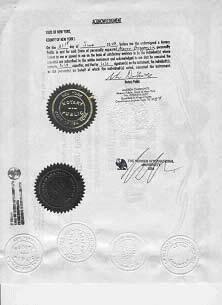 Birth Certificate) intended for use in a country other than where the document was issued. It is a specific and simplified form of authentication of a document compared to a regular "multi-step hierarchical certification procedure" for authentication and legalization, including certification by the Authentication Office of the Department of State and legalization by the embassy or consulate of the foreign country where the document is to be used. Apostille is introduced as an instrument for foreign certification among countries that have joined the 1961 Hague Convention abolishing the Requirement of Legalization for Foreign Public Documents. Documents destined for use in participating countries and their territories should be certified by one of the officials in the jurisdiction in which the document has been executed. Said official must have been designated as competent to issue certifications by "apostille" as provided for by the 1961 Hague Convention. Q. WHO CAN ISSUE AN APOSTIILE IN THE UNITED STATES? A. It depends on a document, and a state in which the document is to be apostilled. 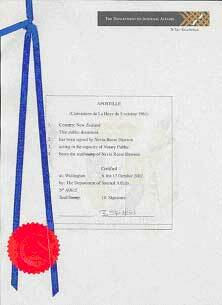 Court papers usually are supposed to be apostilled in the court in which they are issued. State official, military and other specific kind of documents should be also apostilled in the relevant offices. Those are rather rare occurrences though. Most of the time on a regular bases people deal with such documents as vital and school records, copies of different personal and corporate documents, etc. Such documents should be apostilled in the office of the State Secretary of the relevant State. To be authenticated by the Secretary of State a document must be executed or certified by an authorized public official in that state, or notarized by a notary public commissioned in that state/county, depending on the type of a document. Sometimes it can be quite tricky to figure out how to obtain an apostille on specific document. In those cases you might need an expert assistance. Q. HOW TO OBTAIN AN APOSTILLE? A. Apostille can be obtained in the office of the Secretary of State of the required state either by mail or over-the-counter. The requirements may very in different states. The document should be either (1) executed by authorized in that state public official, or (2) certified by the county clerk's office, and/or (3) notarized by a commissioned in the state/county notary public. There are specific requirements to a document for certification by the county clerk's office. Also, not any document can be notarized by a notary public. How to prepare document for authentication by apostille depends on the type of a document, and often requires competent assistance. Q. HOW LONG DOES IT TAKE TO OBTAIN AN APOSTILLE BY MAIL? A. Processing time depends on a state and a workload in the appropriate office, and can vary from a day to 2 weeks or longer. Q. HOW MUCH DOES IT COST TO OBTAIN AN APOSTILLE? A. Fees are different in different states and can be free (Indiana) or vary from $1 (Michigan and Hawaii) to $10 (Delaware, New York Apostille, etc.) and up to $25 (New Jersey and Oklahoma) plus expedited fees where available (in Nevada 2-hour expedite service costs $500 per apostille). Accompanying expenses include fees for the county clerk's certification, and notary fees. Mailing and express delivery expenses and/or travel/gas/parking direct expenses plus time, devoted to this matter, as an indirect expense should also be considered. Q. IS THERE ANOTHER WAY TO QUICKLY OBTAIN AN APOSTILLE? A. Yes, there is. There are agents in major cities that provide expedited courier services, and obtain documents and/or certifications in different local official offices over-the counter. They receive and send customer documents by mail or express delivery service. Their fees may vary, and does not include mailing expenses. Q. CAN A DOCUMENT BE PRESENTED IN A FOREIGN LANGUAGE? A. It depends on the state notary public law and regulations, and county clerk's office running practice. In general, it is not prohibited by law, but can be precluded by public officials.